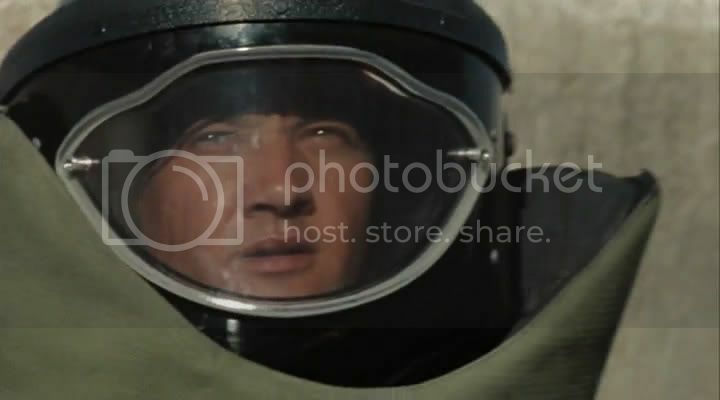 I’m not entirely sure that The Hurt Locker is a message movie. I’m not convinced that it has groundbreaking truths about humanity to reveal, or that it delves into the warped psyche of war. It does not seem to have an agenda; it is not overtly anti-war or pro-violence, but rather in favor of living over dying. On the most basic level the film is a character study of an interesting, disturbing, and possibly disturbed individual. The film opens with an intense scene of bomb defusal that might make even Hitchcock proud. A small squad is on the ground in Iraq, charged with examining a pile of refuse with some protruding wires. 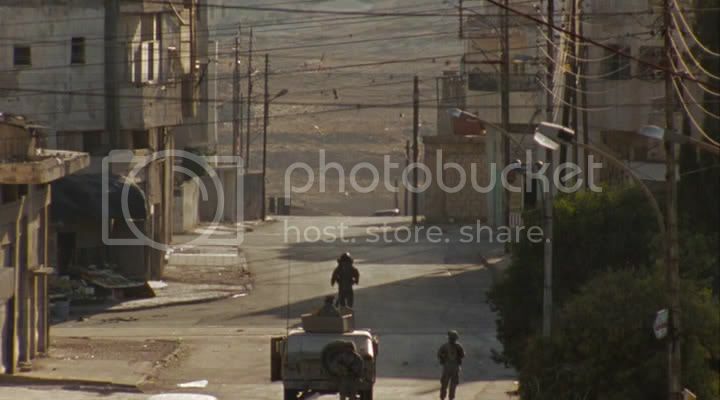 There is danger on all sides, the possibility of snipers in the surrounding buildings, and trip wires or traps that might detonate the explosive. After this first scenario ends poorly, a new bomb expert is assigned to Bravo Company: Sergeant Will James (Jeremy Renner). His fellow squadmates include Sergeant Sanborn (Anthony Mackie) and Specialist Eldridge (Brian Geraghty). It becomes clear from their first assignment that James is not a normal bomb specialist. His methods are unorthodox. He doesn’t communicate well and prefers to tend to matters on his own. It becomes readily apparent that he has an almost personal bone to pick with each successive assignment, as the days count down to the end of Bravo’s rotation. There are a few incidents involving more than a call to defuse an explosive situation. An encounter in the desert with a group of contractors (led by Ralph Fiennes, the only recognizable cast member as the dust and grind renders everyone equal) yields a sniper situation that lasts the majority of a day. A raid on a suspected militant hideout uncovers more than just explosives and armaments. The movie does not have a strong story arc, instead it focuses on the situations that Bravo Company must survive in order to go home alive. The characters are what drive the film. Sanborn plays by the book, which is how he has survived seven years of specialized service. Eldridge is disturbed by his failure in the first assignment, failure that cost a soldier’s life. He talks to a field psychiatrist, Col. Cambridge (“Dexter’s” best villain, Christian Camargo), and their ongoing relationship provides another interesting element to the film. James is the most complex. He seems to enjoy the danger and thrill of defusing bombs, and in doing his job he does not seem to care for the lives of his squadmates. He loves disarming munitions; he’s almost addicted to it. 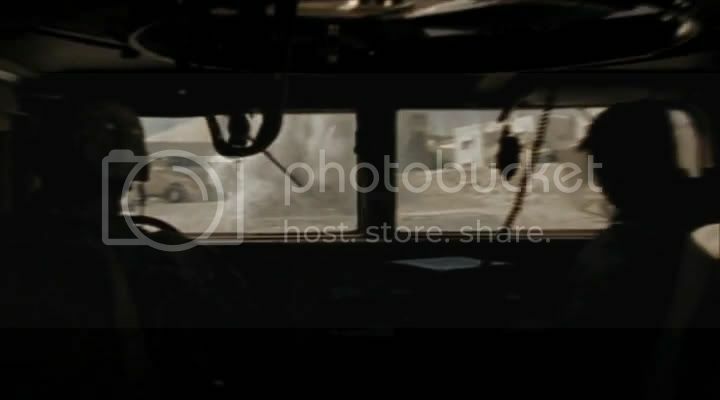 Indeed, a title screen prior to the film indicates that war is a drug, and it is plain that James’ drug is the adrenaline rush associated with his work. He has a softer side that seems perfectly natural and unforced. He befriends a young merchant boy (Christopher Sayegh) who peddles bootleg DVD’s to the troops and begins to take their relationship very personally. The most striking quality of the film are its visuals and intensity. The sand is dusty and gold, both in the desert and on the streets of Baghdad. The directing and editing are superb, as Kathryn Bigelow weaves close-up handheld shots with long, static establishing shots. The effect is remarkable, portraying both the immediacy and intensity of being in combat while providing a solid grounding point in time and space. It is interesting to see all the bystanders on the streets of Baghdad, a reminder that people live in the city and can do nothing but stand by and watch as powerful explosives lie undetonated outside their windows. 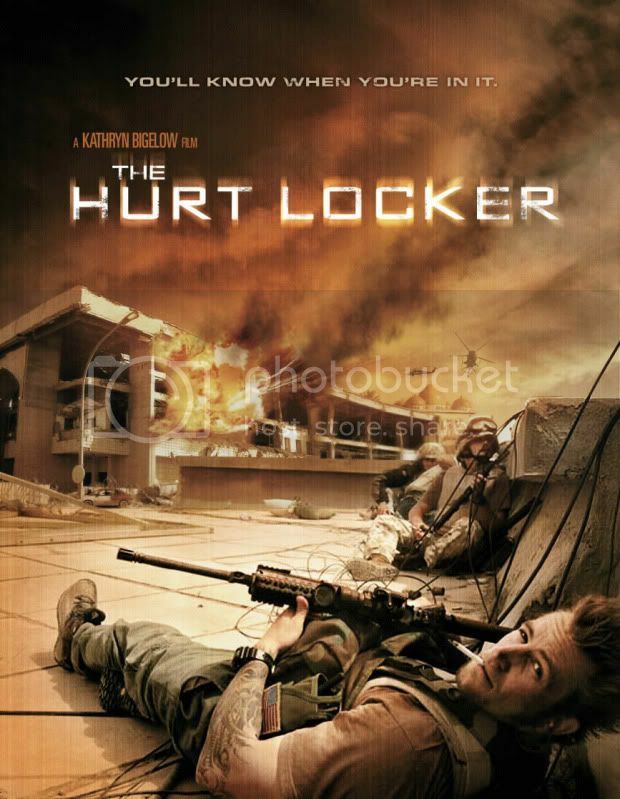 The Hurt Locker is perhaps difficult to enjoy on an entertainment level. James is generally not a sympathetic character, and while he is fascinating it is hard to like him. There are a few other minor faults with the film. It is a bit too long to be continually engrossing, and the level of intensity slows as the film progresses. For a viewer expecting a film with a great moral purpose or objective, prepare to be disappointed. As I mentioned above, the movie prefers to be a character study, showing how these men live out their jobs daily. This is not necessarily a bad approach, but might leave some viewers empty. I appreciated the movie, both the production and its viewpoint on a controversial and interesting subject. It is hard to watch, as some of the scenes are rather graphic while others are disturbingly intense. I would also say that I liked The Hurt Locker, although it contains characters with whom I am happy to only spend two hours and ten minutes. I will not be surprised or terribly disappointed if it wins the Academy Award for Best Picture. This entry was posted in 3.5 pirate flags, 3.5 stars, H, Movie Reviews, Pirate Flag Rating, Star Rating on March 1, 2010 by Tim Irwin.